Go back 20 years ago and mention "wakeboarding" to anyone being towed behind a boat and you would probably get a funny look. Fast forward to today and you would get a funny look if you didn't know what wakeboarding was. 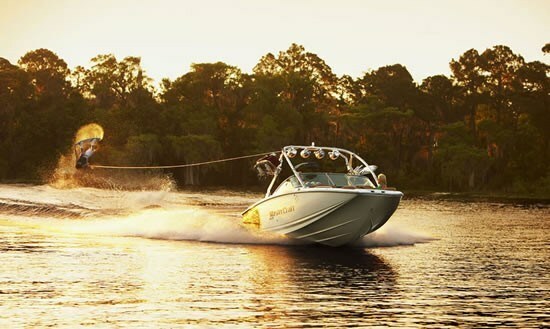 This tow sport has skyrocketed in popularity, even so much so that there are now specific wakeboarding boats for sale. Now tow sports boats for sale is not necessarily a new thing. Companies like Supra have been making water ski boats long before wakeboarding was even thought of. Tow sports boats have changed a lot over the years but the premise stays the same. You need a boat with an inboard drive with a lot of low end torque to pull your skier/boarder out of the water. But it's once they're out of the water where everything changes. Water skiers need a low, soft wake that's easy to cross back and forth with little impact. A wakeboarder needs a large wake curled just right for getting optimal height. Water skiers get pulled from a low point in the centre or back of the boat, where a wakeboarder needs their rope as high up as possible for big air. It's on these basic characteristics that the wakeboard boat was started on, and has grown and grown to a boat all its own. Whether you find a new or used wakeboard boat for sale, they should all have similar characteristics. Number one is a wakeboard tower. This elevates the tow position of the rope to help pull the rider up, rather than bring them down. Many will have some sort of ballast system. This helps make the boat heavier and a heavier boat equals a bigger wake. Underneath is where these boats begin to differ. Once you have a large wake, next you need to shape it and each company has their own way of doing it. Malibu was one of the originators with their wedge, while other companies use wake plates and Supra uses the Smart Plate. There are many other wedges and plates in use and their basic function is to bring the stern of the boat deeper into the water shaping the wake to the rider's specific needs. Another thing these wakeboarding boats have in common is that they are a lot of fun to be in. There's plenty of seating, storage and speakers to turn a day on the water, or "session" as they're known, into a party. When shopping for a new or used wakeboard boat for sale you'll want to look at Malibu and their Wakesetter Lines, Mastercraft's X Series, Air and Super Air Nautiques by Correct Craft, along with Supra, Tigẽ, Centurion and Canadian owned Svfara.